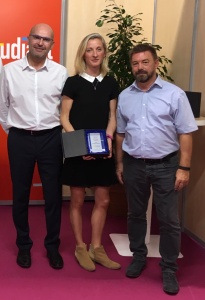 IÉSEG is pleased to announce that the French magazine l’Etudiant has recently awarded the School with the Trophy for Pedagogical Innovation. L’Etudiant awarded this prize for the school’s project “From international to intercultural: promoting cultural intelligence throughout IÉSEG”. The School has been recognized again for its innovative approach to fostering the cultural intelligence of its students, notably through its Cultural Diversity Passport initiative. This passport has been designed to introduce students to the notion of cultural diversity to help them better recognize and respect their own culture and the culture of others, a crucial skill for students working in the global economy. It is compulsory for all bachelor students who must pass two components: an academic course and the International PEER-learning activity that involves a series of guided interactions with someone who is culturally different. Students are also encouraged to participate in one of the many multicultural projects proposed at the school. The School also runs an intercultural training program for all staff, which aims to provide them with the tools needed to better understand cultural diversity in everyday life and help them embrace these differences. Faculty members Ingrid Richard and Grant Douglas, accompanied by Etienne Grimonprez, Director of Master’s Programs, received the prize at an award ceremony held at the Salon de l’Etudiant in Paris in the beginning of October. Intercultural engagement is at the heart of the School’s teaching and learning strategy and is the focus of the School’s fourth center of excellence, which was set up 12 months ago. This center of excellence also celebrated its first-year anniversary on October 18, at an event which brought together members of the IÉSEG community (companies, institutions, associations, and staff), who have collaborated with the School on the themes of intercultural communication and diversity. During this celebration, IÉSEG thanked the Society for Intercultural Education, Training and Research (SIETAR) for a large donation books related to intercultural issues (for the IÉSEG Library).